The popularity of podcasts has been steadily growing over the past few years. There are podcasts covering almost every topic and it’s become a great way for audiences to learn from experts, gain inspiration, and be entertained. Most podcasts can be downloaded for free on iTunes or streamed online via sites like SoundCloud. The great thing about podcasts is that practically anyone can be a guest since you don’t have to record your audio in the exact same room as the host. You can make a guest appearance on someone’s podcast whether you live in the same city or across the world. As long as you have an interesting story or some expertise to share, you don’t have to pay to appear on a podcast either. (Think of appearing on a talk show that’s only sound). This means, if you’re trying to get some affordable or even free publicity for your business or brand, appearing on a podcast is certainly the way to go. I specialize in helping successful entrepreneurs who are passionate about what they do boost visibility by booking worthy podcast interviews. 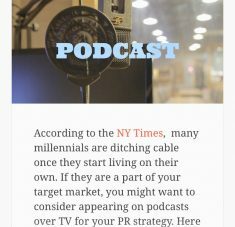 In an article on Due.com, I shared some key tips and strategies for including podcast guest appearances in your PR strategy. In order to leverage podcast interviews for low-cost publicity, you need to understand how they work and which opportunities you should go after. It also helps to establish a solid relationship with the host(s) of the show so you can make sure it’s a mutually beneficial experience. While written content will always be alive and well, people love taking in video and audio content as it’s more mobile since you can listen to podcasts during your daily commute, at the gym, while you cook, or even on a long road trip. This is why I’d heavily advise jumping on the podcast bandwagon and adding it to your publicity strategy so you can reach more of your target audience on a personal level. Check out the tips in my Due.com article to get started!